When the new Ewa Wing of Ala Moana Center opened in November of last year, I couldn’t help but notice a long line outside the Magnolia Bakery Cafe in Hawaii — dozens of hungry first-timers were in line waiting for a table. Frankly, I hate waiting in long lines for ANYTHING, so I made a mental note to come back when all the hype had died down. My opportunity came yesterday, when I grabbed my hubby for a quick lunch. We decided to try the Magnolia Bakery Cafe in Hawaii, located at Ala Moana Center in Honolulu, and we’re so glad we did. Turns out, all those folks waiting in line were well-rewarded when they finally got a table — and we were, too! The atmosphere is just delightful (a word I typically don’t use, but it’s appropriate in this context, trust me). With pastel blue and cream decor, the restaurant feels more like a respite into a dollhouse more than an eatery. Adorable wall hangings, delicate place settings, and fun decorations make you want to hang out longer than it would take to eat a meal. We actually had to drag ourselves out of our table, since eating here felt like a bit of a vacation from the busy mall right outside the door. 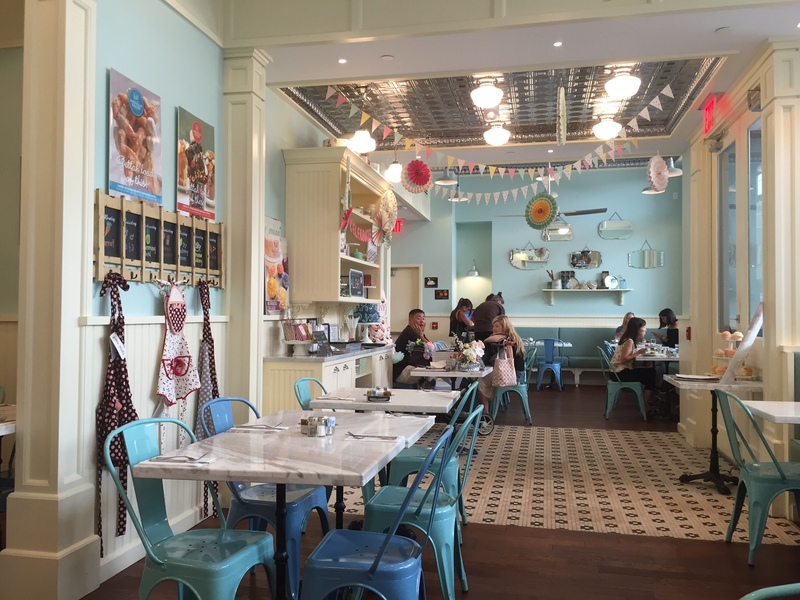 The inviting atmosphere at the Magnolia Bakery Cafe makes you want to stay a bit, even after you've eaten. With blue and cream pastel decor, it's easy to see why the restaurant has such a comfortable "feel." The food is just as delicate as the decor, with all-day breakfast items and “ladies who lunch” type lunch items on the menu. My husband opted for the Chicken Club sandwich, which came on whole grain bread, with bacon and avocado spread (you can choose your side — he opted for a fresh salad). I decided to have the wedge salad for my entree, and I nearly licked the plate clean. Oftentimes, a wedge salad (iceburg lettuce, blue cheese crumbles, onion, bacon, chives, and tomato) comes with a too-heavy dressing that overpowers the salad itself. Not true this time — my wedge salad was served with a creamy buttermilk dressing that was heavy enough to taste, but light enough to enjoy. As I looked around the restaurant, I noticed lots of patrons with decorative pancakes or other breakfast items. It was about 11 am when we ate, so it made sense. And, a nice couple next to us was already drinking cocktails. Seems you’ll find all sorts of folks dining at the Magnolia Bakery Cafe at Ala Moana, even those here to just pick up an order of delicious-looking cupcakes. The only “con” was the service. It took quite a while for us to be greeted at our table, and there seemed to be some confusion about who was our server. But, once they figured it out, the servers were fine. Just be prepared for a more “leisurely” approach to serving here. And, for visitors who want to immerse themselves in local flavors, the restaurant is much more American classic than your typical Asian-fusion restaurant in Waikiki. So, you may feel disappointed if you’re looking for a Hawaii twist to any of the flavors. Better to book an Aloha Plate Food Tour through Hawaii Aloha Travel if you’re looking for real, local Hawaii food. But, the Magnolia Bakery Cafe is a good alternative for visitors who want a taste of the mainland here in Hawaii. 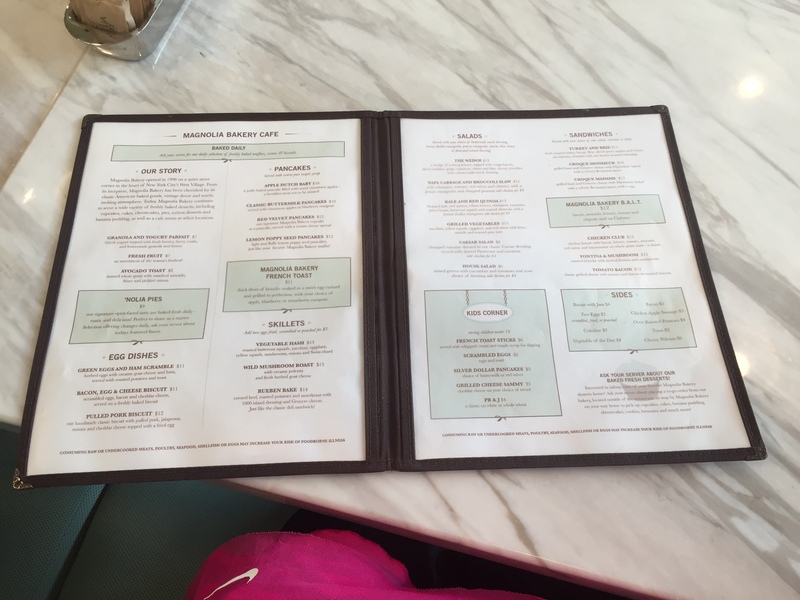 The menu at the Magnolia Bakery Cafe features dozens of breakfast items and delicate lunch items, too. After digging around a bit, I learned that Magnolia Bakery opened in 1996 in New York City’s West Village, and it’s known throughout the world for its classic American baked goods, vintage decor and warm, inviting atmosphere. And, that’s precisely what you get when you step into this charming, delightful, delicate restaurant right in the middle of Ala Moana’s bustling Ewa Wing.